PROsapol: An eco-friendly, alcohol free concentrated liquid wetting agent and surfactant compatible with all dye classifications. 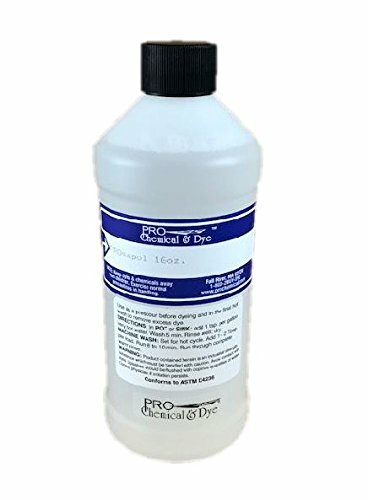 Use with PRO Dye Activator to scour fabric before dyeing. Also recommended for the final hot wash of Reactive Dyes. May also be added to the dye bath to add levelness and aid in wetting out the fiber. Please Note: May create more suds than Synthrapol. Manufacturer: PRO Chemical & Dye Inc. Brand: PRO Chemical & Dye Inc. Publisher: PRO Chemical & Dye Inc. Studio: PRO Chemical & Dye Inc. If you have any questions about this product by PRO Chemical & Dye Inc., contact us by completing and submitting the form below. If you are looking for a specif part number, please include it with your message.